To say that Arturo Sanfelix Garcia is a gifted designer is an understatement. He is also a hard worker and a skilled craftsman who sets high goals for himself, as illustrated in his winning piece, "Passarola." When he started it, he decided to create a piece of art that would test all his skills and still be beautiful. Growing up in a family of jewelers, he brought his vast knowledge to "Passarola," a piece that would be a challenge to craft. He accomplished this while honoring traditional design, Arturo’s favorite style. 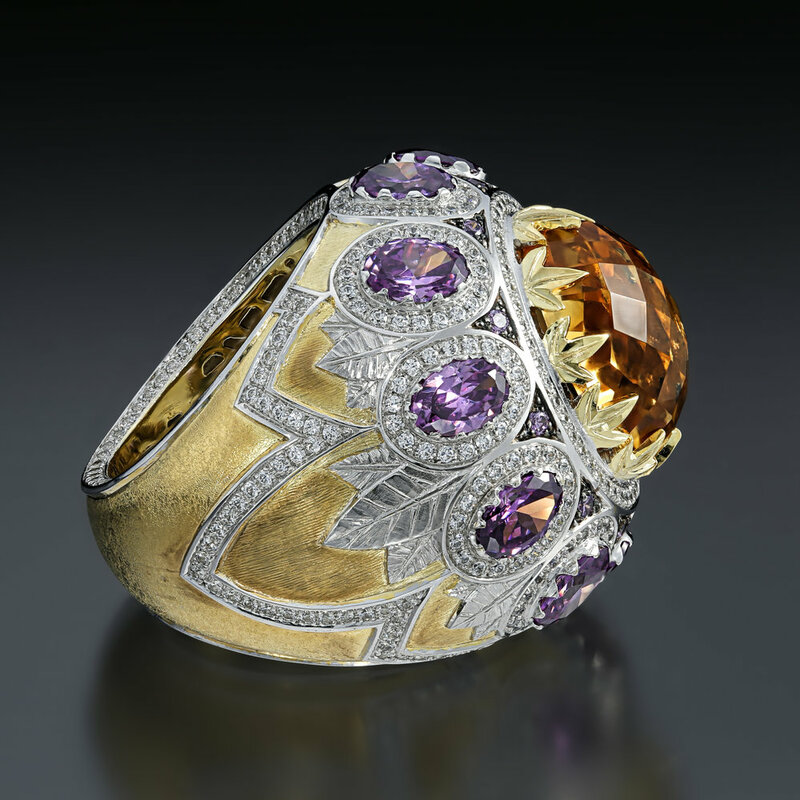 The ring is Argentium® Silver with yellow and white gold plating, simulated amethysts, created diamonds, and the only natural stone is the citrine on top. The piece is cast and hand-fabricated, the leaves holding the citrine were added later. The setting was like one river of stones or modified channel set. I learned to set stones from my father, who is a stone setter; that was the easy part of the making the piece. I started making a piece to be very ornamental, to make a piece that required a lot of work. I didn’t imagine the piece would end up as it is today; it changed as I went along. The one thing I did know was that I wanted a traditional piece. I started making it two years and a few months ago. I worked on it in my spare time. I made it for fun. When I finished it, I thought I should enter it in a contest. The piece spent some time in the closet when I was too busy to work on it and sometimes I worked on it more frequently. I learned that if I want to make a piece with a lot of work, it will take a lot of time. It is better to have a plan than start it without a plan. Yes, if there is someone wants it. Currently there is a person in Spain who is very interested in it, so maybe. Yes. I am not old but I love traditional jewelry. At this moment I prefer traditional more than modern jewelry. I like the engraving of the leaves and the changes of the color of the gold. I also really like the interior of the piece. Yes. It is very big. Valencia, Spain. I have always lived in Spain. I spent three to four years in Switzerland as a child and came back to Spain when I was five. No. I studied fine arts and have a degree from the University of Valencia. The jewelry aspect of my education I learned from my father. He has a workshop, and my brother and I continue working there. It is like an apprenticeship. I have always liked doing things with my hands. When I was a child I painted miniatures. Made wooden boxes. Any work that was artistic I enjoyed. When I finished at the University I was working in my father’s studio and that is when I discovered that jewelry was a perfect art form for me. I have been involved with jewelry all my life. I would see my father working after I came home from school. I grew up seeing works of jewelry. Do any other passions influence your work? I like painting but don’t do it much, and I play the guitar. When I was at the University I worked in sculpture and printmaking. My father. I learned so much from him. He is the person that showed me everything about the process of making a piece. I am most creative during the weekend because I don’t have the pressure of the work. I work as a subcontractor for other jewelers and workshops mostly doing stone setting. 80% of all my work is stone setting. And now my brother and I are trying to make more pieces and less stone setting. My brother and I will be taking over my father’s jewelry studio. I think it was the best day of my life! To win an international award! It was very great! At that moment there was probably no other person in the world who was so happy! That night I didn’t sleep very much! When I finished the piece, I thought the piece was very good and I should enter it into a competition, so I searched for the right one. I saw the Saul Bell award was only for jewelry and they would return your pieces, which some competitions don’t do. The timing the right. Everything fell perfectly into place. This is the first competition that I have ever entered. What do you enjoy about making jewelry? What I enjoy most is carving on the material/metal. I like to follow trends and I use what fits with my designs. Right now it is yellow gold and colored stones in Spain. I make textures on the metal. It is in downtown of Valencia, which is the commercial center of the city. There is a lot of life, energy and people there. I would like more natural light. Really the tool I always use are the zoom lenses; without that I couldn't work comfortably. I listen to music. When I work I listen to progressive rock. One word of advice when starting to make jewelry? To create works that make you think and measure twice when you start making a piece. My advice to people who are starting to make jewelry is that the more they learn, the better it is. Never lose your passion and inspiration. Buccellati is an Italian designer that used a lot of textures. To have won the SBDA. That recharged me with extra strength to continue to make designs and to enter competitions. It has also made me think about making jewelry not just for other people but for myself. Joël Arthur Rosenthal or JAR is now living in an area of France where he is among a group of very important and influential jewelers. He doesn’t have a store but if you are lucky and get invited, you will meet him in his private studio in the Place Vendome. He is a legend. The mystery jeweler.